Reaching the halfway point of the NHRA Countdown just shows how critical the next three races will become and what is yet to predict in the upcoming weeks. At the conclusion of the Keystone Nationals at Maple Grove Park when the rain stopped, leaving clearing skies, the action was fierce with plenty of close racing and records falling by the wayside. As the racing continues in October, many of the NHRA teams changed up their liveries in honor of Breast Cancer Awareness with plenty of pink in the pits. The race was in doubt going into the weekend with the influence of Hurricane Joaquin sending up too much moisture for the area, allowing only one round of qualifying completed on Saturday. 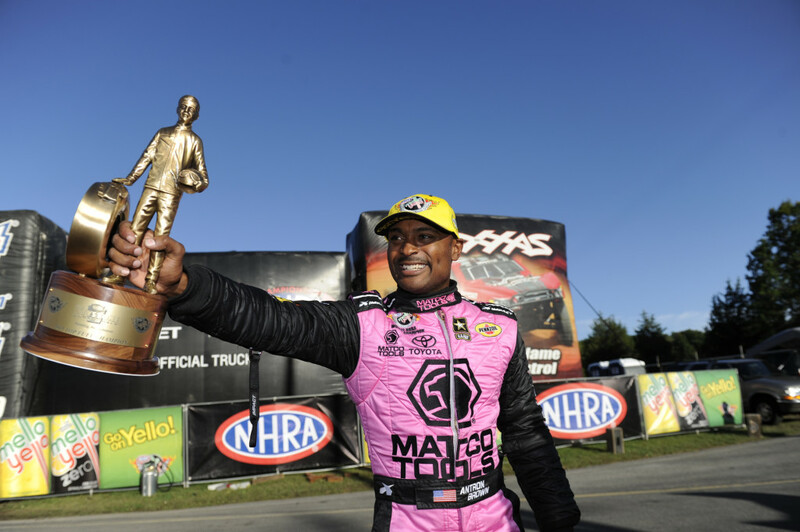 Then on Sunday morning, Antron Brown went out, winning his third Top Fuel NHRA Countdown race in a row, taking out his Don Schumacher Racing teammate, Tony Schumacher for the Wally. Jack Beckman secured the Funny Car National ET Record again this season, lowering it to 3.897 seconds, beating Chad Head on a surprising holeshot in the fuel coupe money round. Chris McGaha won the starting line battle and it showed at the finish against Greg Anderson, winning at Maple Grove on a Pro Stock holeshot. Andrew Hines scored his second win in the Countdown and third of the year, holding off a determined Chip Ellis in the Pro Stock Motorcycle finals. Antron Browns looks nearly impossible to beat after winning his third consecutive NHRA Countdown event in Top Fuel, setting the record for such a feat. Now at 12 -0, Brown collected his seventh win of the season and 54th in his racing career. Starting from the No. 12 position, Brown used a consistent tune-up from co-crew chiefs, Brian Corradi and Mark Oswald, to drive his bright pink Matco Tools rail to passes between 3.71 and 3.74 seconds all day. His slowest elapsed time was 3.742 in the opening round against Clay Millican. 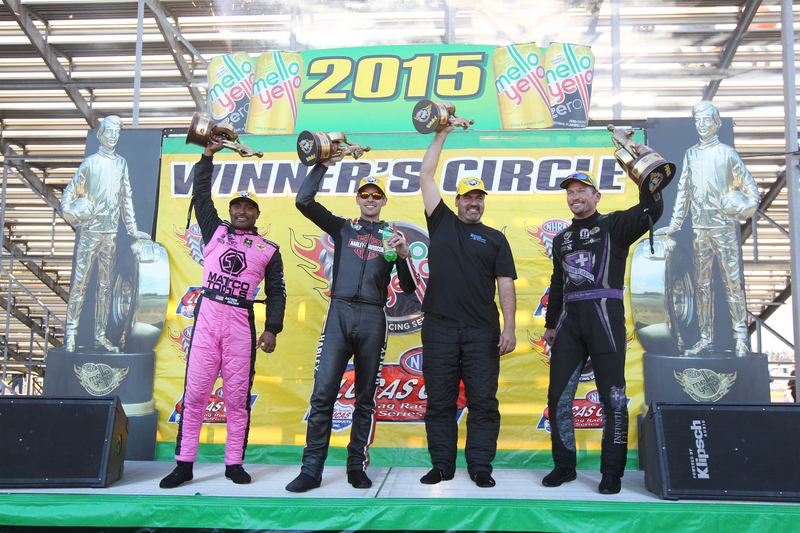 He also defeated Dom Lagana, Larry Dixon, and Tony Schumacher in the final round. “This day was just a true blessing,” Brown said after his great start in the series. “That first round was a crap shoot and the thing I’m blessed to have on my side is [crew chiefs] Brian Corradi and Mark Oswald with this entire Matco Tools team. They just did a great job and to win the first race out with the ‘Tools for the Cause’ colors is amazing. When Brown and the Matco team won the 2012 NHRA Top Fuel championship, they won 11 rounds in the Countdown. 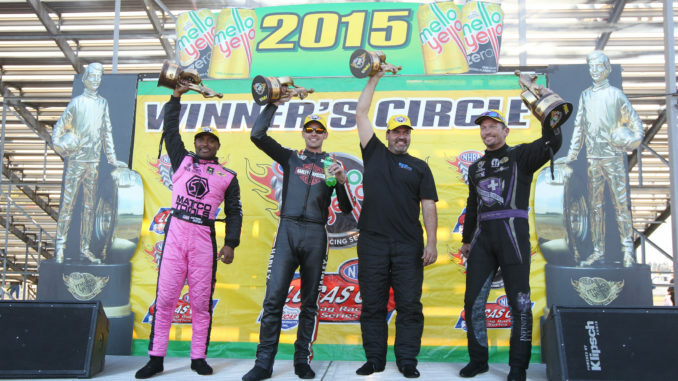 They already have 12 round wins with three races remaining on the 2015 NHRA schedule. The non-stop Brown kept the heat on, turning in a time of 3.717 seconds, 308.46 mph to beat a tire-smoking Schumacher in the finals. Brown now leads Schumacher by 94 points. Third-place Brittany Force trails by 194. 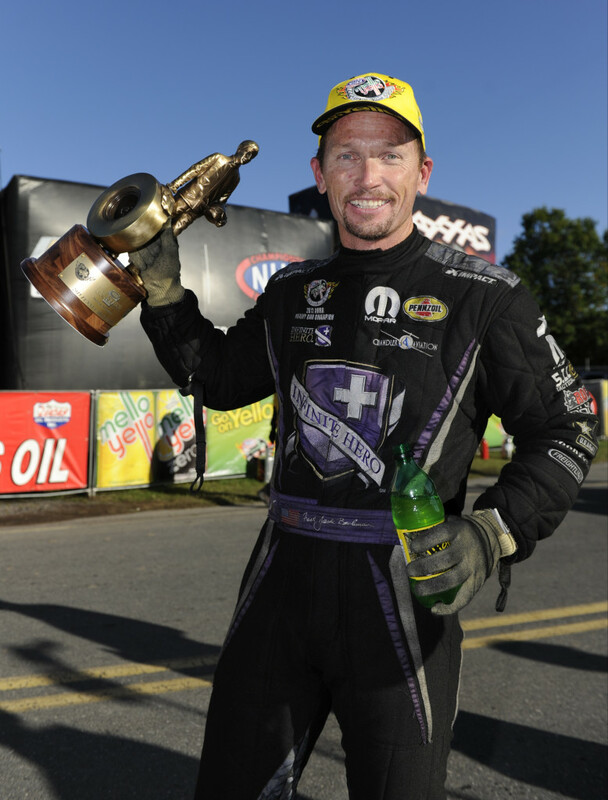 The Infinite Hero Dodge Funny Car of Jack Beckman entered the Countdown with plenty of swagger. Things since haven’t necessarily has gone his way recently with the resurgence of Del Worsham taking the titles in the first two Countdown races. He lost in the first round in St. Louis and fell to fourth, 119 behind Worsham. It was only after reflecting back on his success this season that Jack looked ahead to Maple Grove Raceway as a turnaround event and his plan was successful. On the lone qualifying on Saturday, Beckman dropped cylinders, but managed a 5.440 second pass that was worthy of a third place start on the ladder. Robert Hight was low ET qualifier at 3.922 seconds, 320.34 mph. He will arrive in Dallas in two weeks second in points and only 16 behind Worsham, who lost in the first round to Beckman’s DSR teammate Tommy Johnson, Jr. Going into the finals having lane choice over emerging Funny Car talent, Chad Head was just the confidence he needed by running slower than Head, but was first at the finish. Beckman left the line with a .077 light against Head’s .115. Chris McGaha entered Sunday’s Pro Stock eliminations with a change in crew chiefs and, despite the disruption, he was still on top of his game, collecting his third win of the season at the Keystone Nationals, vaulting him from sixth to third in the standings with three races to go. Fortunately for McGaha, he contacted Tommy Utt and put his knowledge to full use on his fast Chevy Camaro. After qualifying in the No. 2 position on the single allotted pass, McGaha made a very strong run in his opening round defeat of Val Smeland as the first Pro Stocker in the 6.40 category in the race. Second round, he eliminated Jonathan Gray on a red light. The semi-finals caused him to be ready for anything and he used his starting line skills here to beat Bo Butner’s quicker time on a holeshot. The final round set up a meeting with one of the most successful Pro Stock drivers in the history of the sport, Greg Anderson. McGaha was unperturbed, however. He kept his cool, left the starting line with a big advantage, and brought home the win on a 6.492 second, 213.64 mph pass to Anderson’s quicker time of 6.484, 214.59 mph. Just 104 points separate McGaha from the top spot with three races remaining before the championship is decided. Leader Erica Enders-Stevens is 72 ahead of Anderson and McGaha is just 32 points behind Anderson. In Pro Stock Motorcycle, Andrew Hines picked up his third win of the season and second in the Countdown with a 6.794 at 197.25 mph to win over Chip Ellis on his Screamin’ Eagle Vance & Hines Harley-Davidson. Hines, the four-time and defending world champ, picked up his second win at Reading and 41st of his career, which ties him for second on the all-time category wins list with Angelle Sampey. 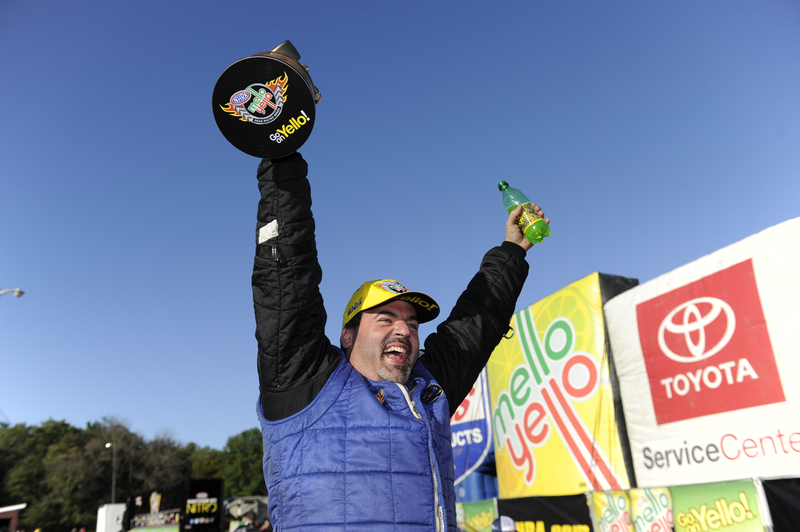 The NHRA Mello Yello Drag Racing Series begins the second half of the Countdown to the Championship playoffs in two weeks at the AAA Texas NHRA FallNationals, Oct. 15-18, at the Texas Motorplex in Ennis, Texas.